Wednesday September 5, 2018 - Jubilee Members of Parliament (MP), who were involved in the passing of the fuel tax bill, now claim they were hoodwinked into passing the punitive law. 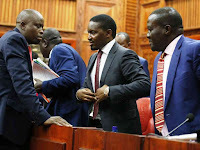 Led by Kieni MP, Kanini Kega, who was among those in Parliament who passed the bill, the legislators claimed that they were misled by President Uhuru Kenyatta and Treasury Cabinet Secretary Henry Rotich into passing the VAT Act of 2013 that prescribed the 16% tax on petroleum products. According to Kega, they passed the bill in anticipation of developments in oil explorations in Turkana. “This has not happened,” said Kega. The MPs claimed that the matter was now beyond them and that only Uhuru can save Kenyans from the high cost of products occasioned by the new fuel levy. “The members made their announcement on the Bill on the floor and unanimously agreed to suspend the tax,” he noted.